What’s in a drink. What’s in a drink. 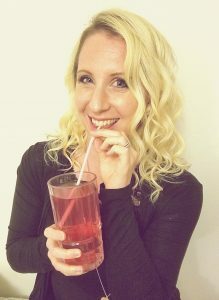 What’s in a drink? The thought plays over and over again like an echo in my head. So random. Why drinks? Hmm. My mind skips all over the place on the metaphors that could correspond, shattering the echo into a thousand pieces. Do I mean an alcoholic beverage, perhaps? Those can be tasty…or toxic…or both. Stories, lots of stories there. Lots of pictures of happiness and destruction to be painted. Sure, that could be it. Or maybe a health tonic? I’m big on those. I keep up with the latest trends, for sure. Right now it’s matcha instead of coffee. Matcha lattes made with almond milk of course because dairy is bad. I get them on the daily from the trendy hipster coffee shop near my work. I pair it with a vegan almond chocolate scone. My brain is trained to make the word ‘vegan’ synonymous with healthy. Even though I know it has processed flour and sugar. It must have those things because it just tastes too good. Coffee is out right now. Unless of course, the coffee is cold-brewed and in a fancy little overpriced bottle. Then you bet I’ll snap it up, dump it in a cup on a Sunday morning and drink it cold in practically one gulp. I keep a bottle of turmeric ginger pressed juice in my desk drawer. It says to consume within 20 days of opening. I haven’t opened it yet. I can’t decide what to put it in…or do I just drink it straight up, like a shot? Maybe I’m just talking about my kids’ juice boxes, and a picture flashed through your mind of a slightly anxious, tired, blond woman standing in the chaotic center of the local Costco with her agitated young daughters, trying to read the side panel of a small Tetra-Pak box to see how many artificial fillers are contained, and is it worth all the sugar? Is that what you pictured? Nope, that’s just my mind? Okay then. Maybe it’s not an actual drink at all. Maybe it’s more like, as the saying goes, “drinking the Kool-Aid” of an ill-intentioned idea. Perhaps I am trying to backpedal as I analyze the consequences of a recent decision I made, wondering if I did the right thing. Or did I get sucked in (again) to something I shouldn’t have? Was it a purchase from an ad I saw last week? Did I watch a video about something that upset me, and then lash out at my children? At my husband? At myself? Hmm. So many possibilities. Let’s go back to the alcoholic beverage though, for a minute. I’ve recently been getting these delicious little peach flavored wine in a can four packs from Trader Joes. I bring them to small group Bible study on occasion and drink one, sharing the rest with the others. Is that wrong? It sounds wrong. Everyone is OK with it, and enjoy it, but…am I making the right choice, or clouding everyone’s judgment? Speaking of alcohol, my husband came home past midnight with the cripplingly pickled sour smell of drink on his breath. I could smell it from across the room, and it made my stomach turn. I told him to go brush his teeth before he came to bed. This was after I worry-texted and called him after shivering alone in my bed for a couple of hours. He said he was at his friend’s house. Another friend he hadn’t seen in years was over and they were hanging out. He apologized for not calling. For making me worry. But I was already mad, and I couldn’t let it go by the time he walked in the door. I hadn’t wanted to tell him about his breath. I had wanted to hold him. To tell him about my day. Talk about how fiercely cute our daughters were, and what they had spent their afternoon doing. To marvel with him over how grown up our almost 2-year-old was getting, and what I wanted to do for her upcoming birthday. But I didn’t say any of that. I simply commented on his breath. He said he would brush his teeth and come up to bed in a little while. But I woke up alone in the bed. He had fallen asleep on the couch downstairs, watching TV. So much is in a drink. More than I can unpack in one sitting. Lives are shaped, bodies filled, emotions muted. One can drown their sorrows, and their dreams right along with them. One can shatter their entire world, glue it, and then fill it up again like a tank, with liquid dribbling out at the seams. I am reminded of the picture of the little Dutch boy with his finger in the crack in the dam. He looks so worried. He is stuck in place. He cannot move or the whole dam might break. Am I already drowning, or is my finger just stuck in the dam? The thought comes forward and dissipates like a phantom. Out of nowhere. It takes me by surprise because I am generally filled with hope and joy and possibility. I am saved. I have Someone to cling to. But right now I am exhausted. And my head is full. I feel almost drunk, even though it’s 9 o’clock in the morning and I’m sitting at my desk. I drink in the notion that maybe I am stuck. Not because I am without hope, but because I need to make some decisions about how to move forward with my life. Why am I here, God? What would you have me do? The question pleads as I stare at the metaphorical dam in front of me, the finger of my negative thoughts firmly in place, sealing it all in. “My cup runneth over.” The Psalm repeats in my head from memory as a reply. I look again at what I have. All that I have. A quick inventory is run. As it turns out, I have much to give. My glass is pretty full. I have been given many blessings, haven’t I? So why am I not sharing them? That’s the real problem, isn’t it? It’s not what the drink is made of. It’s that my glass is full to the brim. I have more than I need and I’m stuck in place because I’m not sharing. 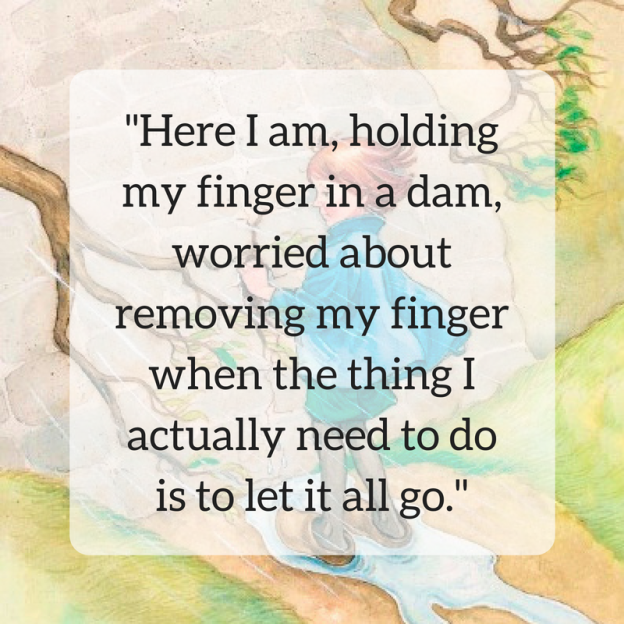 Here I am, holding my finger in a dam, worried about removing my finger when the thing I actually need to do is to let it all go. I laugh out loud. I have much to give. Much to say. Much to do. So here I go. I am starting with you. This entry was posted in Connecting, Motherhood, Wisdom and tagged feelings, giving, life, thought stream on June 28, 2018 by cslyngman.